The answer to this question is not as hard as it may seem on first sight, but nor it is easy to answer. First of all, you should decide for yourself why exactly you need it. In the case of SLR cameras, high price doesn’t guarantee quality at all. Besides, it often happens that photos made by inexperienced photographers on SLR cameras appear to be worse than ones made on the usual digital point-and-shoot cameras by professional photographers. So, if your goal is to know a little bit more about the art of photography, to make portrait pictures of your friends and family, and to have a great collection of your child’ s photos – the best decision for you is to buy a cheap amateur SLR camera. Nine out of ten times, you will never need any more advanced functions than those found on the photo camera. If you purchase an SLR camera in order to earn money on photography, however, you’ll have to think about finance more thoroughly because you will need much more than just a standard set with usual camera lens. Add color filter, a couple of pro-lenses, an external flash, a tripod and a special bag to this, plus much more. For sure, it appears to be expensive. 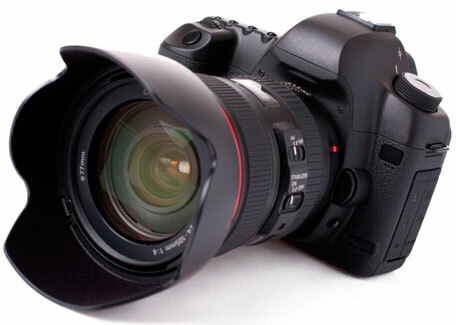 So, if you still cann’t decide what the goal of the purchase will be (moreover, if you do not exclude the possibility of a professional career), then you should choose a basic model of photo camera in a professional range of models in order to avoid problems with the product’s upgrades in the future. When beginner photographers pick out a photo camera, it is necessary to know that brand doesn’t play a very important role, after all. What does matter is that it will be hard to get rid of later. Imagine that you bought the Nikon camera, but later on you decided to switch over to the Canon. What will you do with all the accessories that you bought during the last couple of years of usage? You’ll hardly be able to sell it for a good price because each photographer assembles his or her own collection of accessories according to their own tastes and requirements. Actually, there is no longer any difference between the technical innovations of leading companies. As soon as a competing company adds any new detail or know-how function, another one tries hard to surpass the competitor, developing the competitive analogue. There are no essential differences between SLR models of different brands. The main (and only) difference between all the photo cameras in the world is the photographer that is using it at the moment. There is a proverb among photographers which says that the best camera ever is the camera you are using at the moment. In the majority of cases, the question of which brand to choose reduces itself to the dilemma – Nikon or Cannon? Why so? Can it be possible that there are no other competitive brands? Of course there are. Not only Nikon and Cannon, but also such companies as Sony, Olympus and Pentax produce SLR cameras. Each brand represents a whole range of SLR cameras, starting from products with democratic prices for the amateurs and ending with tricked-out devices for super professionals. Today’s reality, however, is that only two manufacturers have no problems with the lens and additional accessories, and they are Canon and Nikon. Everything is not that great with Sony and Pentax, not to mention Olympus. The range of accessories in these trademarks is not as wide, but the prices are remarkably higher. So, if you want to use your camera for a long time, chose one of the industry leaders’ products. SLR camera production companies divide their products into two groups: professional SLR cameras and amateur ones. This fact sufficiently simplifies the choice. Nikon represents professional and amateur SLR cameras, whereas Canon subdivides its products into three segments – amateur cameras (consumer): 450D, 500D, 1000D; semi-professional ones (prosumer): 50D, 7D; and professional ones (pro): 5D, 1D. So if you had bought the SLR camera in the amateur range, do not consider yourself the happy owner of a professional gadget. You are still no more than an advanced amateur and the main work still has to be done. It seems profane to mention any flaws if we are talking about the smart set in the world of photo cameras. Unfortunately, though, nothing under the sun is perfect. The first and foremost issue is the high price on these goods. The average price of base models is about 600 to 800 dollars and more advanced cameras would cost you at least ten times more. It would not be that big of a problem if expenses would end with the purchase of the camera itself, as is the case when you buy an ordinary point-and-shoot camera. Not in a thousand years! Your expenses are just beginning now because purchasing an SLR camera is to buy just the core tool, the “body” in photographers’ slang. Now, you should buy lenses, light filters, and flash devices, not to mention a special bag for carrying and storage. At first, it is possible to get away with just an internal flash and standard lens, but as goals and tasks change, you will have to be ready for the inevitable expenses on further equipment and accessories. The second drawback is the camera’s weight and size. You cannot just put an SLR camera in your pocket, as you can do with a P&S camera, neither can you take it with you easily everywhere you go. You will always need two hands to hold an SLR camera, hence you will always try harder to hold it right. A longer photo shoot can be rather exhausting, so, in this case, a tripod can be helpful. The third problem is neither related to all the SLR cameras as a whole, nor to any type or model in particular. Some of models are devoid of the options that are very important to a beginner. For example, it is impossible to show photos taken on the LCD screen just in the process of photographing in order to improve in mid-shoot (“Live View” option) and the “Video” option is also absent, as well as a range of other options we got used to having with P&S cameras. So, if there is an option that is important for you at the moment, pay attention to the model of SLR camera you want to buy and check whether or not it has this option. Advantages of the SLR cameras. Higher-quality photos are attained thanks to the high-sensitivity matrix, wide dynamic range, absence of speckles on high definitions in ISO rating, etc. Quick auto focus gives the opportunity to make pictures literally in one touch, without waiting until the camera tunes itself. There is a high-speed zoom control, thanks to which we can enjoy the option of burst mode. By pressing the shutter button, we initiate a series of photo shoots made with the speed of 5 to 10 shoots per second. This option can hardly be underestimated, especially while shooting children, sport events, reports, etc. Carefully cautious ergonomic design guarantees comfortable handling and easy button pressing and their handy and smart arrangement that would allow you to master your device without even looking at buttons. When purchasing a certain SLR camera model, you can choose the “body” package option, which would include only the camera itself without a lens, or a baseline package with a standard lens in it. Obviously, it’s impossible to make photos with only a camera and no lens, so if you have decided to choose a “body” variant, then be ready to choose the lens you like for it, too. You might wonder why cameras are sold without lens at all, and the answer is that experienced photographers with a wide collection of lenses would not need another one if all they want is just to replace the body of the camera. If you are choosing your first SLR camera and your goals are ambiguous, it is better to chose a kit-lens. It will be quite enough for you to become more experienced, master photography and take better shots. Later on, you will definitely decide to purchase a new, more professional one, and then you should be aware whether the camera possesses OIS (Optical Image System). This option helps to diminish the influence of shaking hands on the quality of the shoot. 1. Analyze the tasks and reasons as to why you need to buy an SLR photo camera. Screen over all the advice and information that was given to you by friends and acquaintances. After that, decline the most expensive variants of choice and, in the end, you should have only a small number of models to choose from. 2. Attend the shop and get yourself acquainted with the models you have already chosen for yourself. It is useful to put the camera in hand, to feel whether it fits your hand, but at this stage you don’t have to investigate all the little buttons and their functions. Handling it well is just a matter of time and habit. You can also borrow a memory card from one of your friends, shoot several photos right in the shop, and examine shoots on your computer later on. Maybe it will be the quality of shooting that will help you to make right decision. Frankly speaking, however, the difference between SLR cameras of amateur level lies only in their price. 3. Concerning lenses, for the best picture quality, a lens is much more important than the camera itself. Although, it is undeniable that just the hands and talent of the photographer become a key factor in this activity. It is not recommended to buy an expensive body and cheap lens. You’d better do vice versa or just opt for camera and lens set. A kit-lens supply package is the best decision for the beginner, and you can always replace it with a more professional one when you want to become more experienced. 4. If a comfortable menu is crucially important for you and you crave for an easy-to-understand and easy-to-use menu list, choose Sony and Olympus. They all have so called “starter-options” (for example, the menu is provided with hints, OIS, entertainment moments). However, keep in mind the fact that it may be rather problematic to find accessories for them.